I once earned two shillings and sixpence for winning a One Mile race during half-time in a football match at Telford Town. This was about fifty years ago, thus in the bad old days of amateurism; so I must emphasise that the cash was for expenses only! In modern money, that would be twelve and half UK pence or a bit less than 20 euro or US cents. I relate the tale of this pathetic pittance merely to underline that I have no problem whatsoever with athletes getting paid, which they do even in a World Championships – $60,000 for first place, $30,000 for second, $20,000 for third, down to $4000 for eighth, since you ask. But seeing Usain Bolt, ultimately bronze medallist, and Christian Coleman, eventually silver medallist behind his US colleague Justin Gatlin lining up for the 100 metres semi-final on Saturday night afforded a spasm of amusement in that here was a match that Diamond League promoters would pay upwards of half a million dollars to stage. And the guys were doing it for nothing. It reminded me of one of the first occasions I came across such a match in modern times. It was at the inaugural World Championships in Helsinki 1983; and it was the heyday of the Seb Coe, Steve Ovett, Steve Cram middle distance era, when the trio made a virtue of avoiding one another as best they could, except of course outside championships, whether Olympics, Europeans or the newly instituted World Champs. Accordingly, a match that European promoters would have paid big bucks to arrange, Ovett v Cram (Coe was injured that year) was thrown up in the semi-finals of the 1500 metres in Helsinki. Again the dudes were doing it for nothing, as they also did in the final (won by Cram) a couple of days later; since this was the decade during which the sport was edging laboriously towards open payment (since, as you know there had long been clandestine payments). Track runners, including even Mister Millions Usain Bolt can afford to accept less than on the circuit, because the World Championships are the showcase that their shoe and clothing sponsors demand they appear at; and success is going to reap them not only huge publicity but also bonuses from said companies anyway, more than making up for any shortfall when comparing them to market rates on the circuit. All of which brings me circuitously to Marathon Day at the IAAF World Championships in London. The same rules do not quite apply, simply because the big city marathon promoters pay stratospheric fees; which is why you do not see too many of the marathon stars in the World Champs marathons anymore. The Berlin Marathon late next month already has the mouth-watering match of former world record holder Wilson Kipsang and his Kenyan colleague, Olympic champion Eliud Kipchoge, who came agonisingly close to two hours in an ultra-stage-managed demonstration run, organised by his sponsor on a sheltered motor racing circuit three months ago. And I understand that there is even a possibility that they will be joined by last year’s winner, multiple Olympic and world championships winner and world record holder, Kenenisa Bekele of Ethiopia. They are partly attracted by the world record course in Berlin, so are prepared to accept less than in a London, New York or Boston Marathon. Since a world record reward would more than compensate. And to give you an idea of the sort of fees on offer, rumour reaches me that Mo Farah has, for example turned down $200,000 to race the Frankfurt Marathon in October, the implication being that it wasn’t enough. Which is not to demean the medallists in the marathons yesterday. They have got form, Men’s gold medallist in 2.08.27, Geoffrey Kirui of Kenya won Boston this year; the second placer in 2.09.49, Tamirat Tola of Ethiopia won Dubai; and bronze medallist in 2.09.51, Alphonce Simbu of Tanzania was fifth in last year’s Olympics. But Britain’s Callum Hawkins who recorded a personal best 2.10.17 for a hugely meritorious fourth place is representative of the type of runner who will benefit enormously. Because the event nowadays is primarily for second rank or emerging marathoners who want to make their mark. The women’s race featured an even more illustrious representative, given that Edna Kiplagat of Kenya has twice won this event before and has also won the London Marathon. 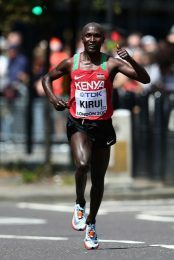 It looked briefly with less than five kilometres to run on Sunday afternoon that Kiplagat would make it an unprecedented hat-trick. But her former colleague Rose Chelimo, now running for Bahrein had paced herself perfectly, and ran on to victory in 2.27.11. That time was illustrative of a sedate early pace of which 38 year old Briton Alyson Dixon took full advantage. Dixon enjoyed a lead of up to half a minute for over an hour, treating herself and the crowds lining central London. Reality struck in the closing stages when the East Africans, tracked by Amy Cragg of the USA took over. Dixon eventually finished 18th, but still exultant. 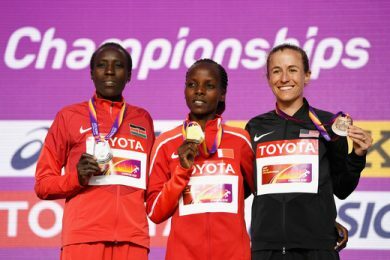 Kiplagat narrowly added silver to her two golds, in 2.27.18, with Cragg an overjoyed bronze medallist, on the same time. The financial bottom line is that all of these runners will have increased their appearance money on the big-city marathon circuit; and Amy Cragg excepted, the marathoning bottom line is that East Africa still rules – OK?